Working and hanging out with creatives for at least five days a week definitely doesn’t mean that we’re sitting hunchbacked at our workstations, typing, designing, programming, or researching all day! Whenever one of us stumbles on something really interesting, we share it with everyone else through conference chat, and we make our exclamations, gesticulations, and/or violent reactions before continuing with our work. On days when deadlines are pressing in and our line of vision is either getting blurry or going red, you can say this sort of inspiration-sharing is what keeps us sane. Of course, since we can’t share our private conference chat with the rest of you (that would be way too much distraction! That’s why I try not to chat too much on my Google Plus account now, for those of you who’ve been able to connect with me there) we thought we could at least collect what we found the most interesting during the week and share it with all of you, without necessarily having any theme or reason for it – we just want to inspire you, too! So here’s to trying out this new series of inspiration. Hope you like, and if you find more inspiration we should check out, shoot it to us anytime via Facebook or Twitter! Errol Veloso has a great resume design going on that gives the previous ones we featured pretty tough competition! (Source)I didn’t hear about this the first time it came out so I apologize if it’s old news to other people, but this map is really blowing my mind right now. 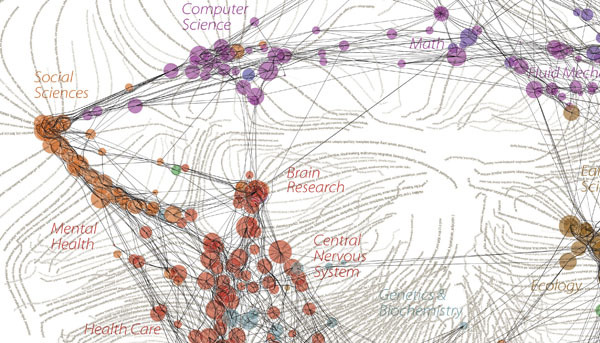 It’s a map of relationships among scientific paradigms, made by sorting roughly 800,000 published papers into these 776 scientific paradigms, which you’ll see on the map as nodes. The curved black lines are made between the paradigms that shared papers and act like rubber bands that keep similar paradigms nearer, so the layout is derived directly from the data. The flowing labels list common words unique to each paradigm; the large labels are general areas of scientific inquiry. Sean Brown, Brand Director of the website the art of re use, sent us vintage poster art from their Interim Ivy Spring 2012 LookBook to enjoy. Junda‘s portfolio is a collection of digital art, printed material and photography. (Source)Chris Nielsen has a gallery of motorcycle inspiration on his website, most of which comes in three versions – from full-color giclee, to outlines of his highly-detailed vector illustration work, to transitional versions that ride between the two previous styles. Jeff Nichol has some galleries on paint, portraits, people and press on his website. Jonathan Faust‘s clean minimalism shows not just on his website, but also in his projects. Rex Monkey‘s shirts exude a very urban, graffiti-inspired feel. Lastly (for now), Alexander Chin of Mood Garden shares with us their unique tea packaging as part of their efforts to change the way we drink our tea. That’s all for now. I hope you enjoyed going through this post as much as I enjoyed finally sharing all this inspiration with you! For now we’ll try to do this once a week, so if you have other inspirational material you can recommend, we highly recommend that you share it with us through our Facebook or Twitter accounts. Did we feature your work? Let your friends know! Have them subscribe to the blog feed while you’re at it, too!